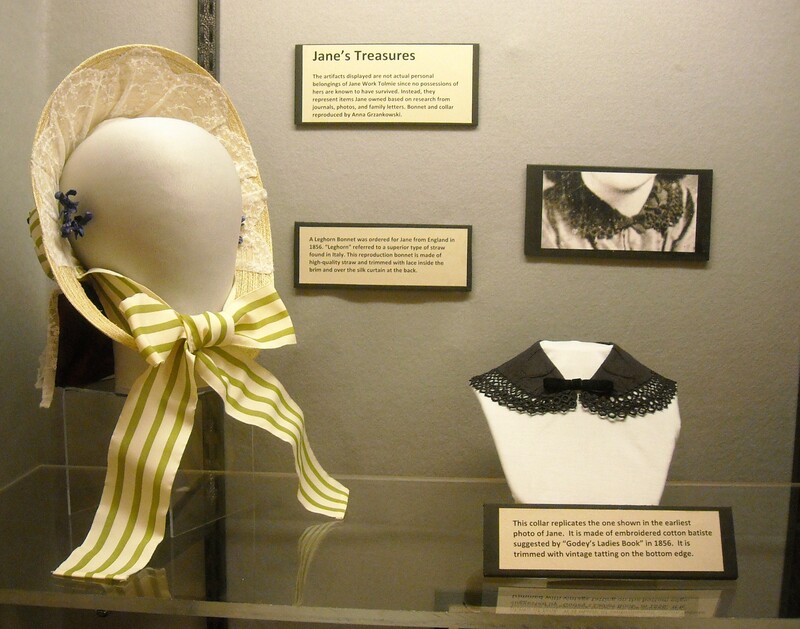 First reenactment of the 2012 season, a dress for a little girl, and the exhibit opens! Happy Monday, readers! 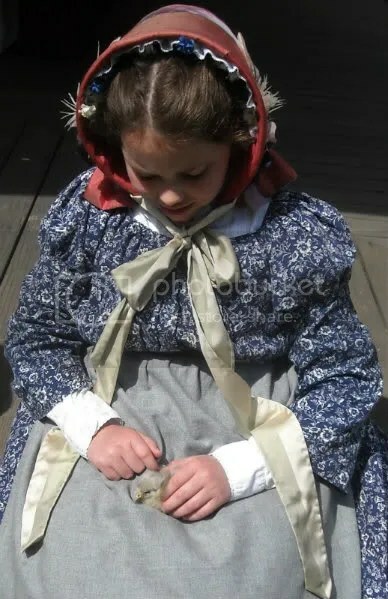 This past weekend was the first reenactment out at Fort Nisqually, “Sewing to Sowing.” This is always a great way to start the reenacting season, as it combines the crafts of both sewing and gardening. I didn’t get too many photos, as I was mainly busy demonstrating and teaching sewing and doing various errands, but I thought I would share photos of the silk sewing apron I finished recently, but didn’t have occasion to wear until now. Quite appropriate for a sewing event, no? Silk taffeta sewing apron, based on an original that had pockets and a gauged waistband that connected to a cord. I also did my hair in a different style than usual, and got so many lovely comments and questions about it, that I’ve decided to do a little tutorial. I’m hoping to film that this upcoming weekend, as for the first time in a long time, I have no commitments during the weekend. Oh, and please ignore the little swoopy piece at the bottom. The photo was taken at the end of the reenactment, and by then my hair was just done staying in place. 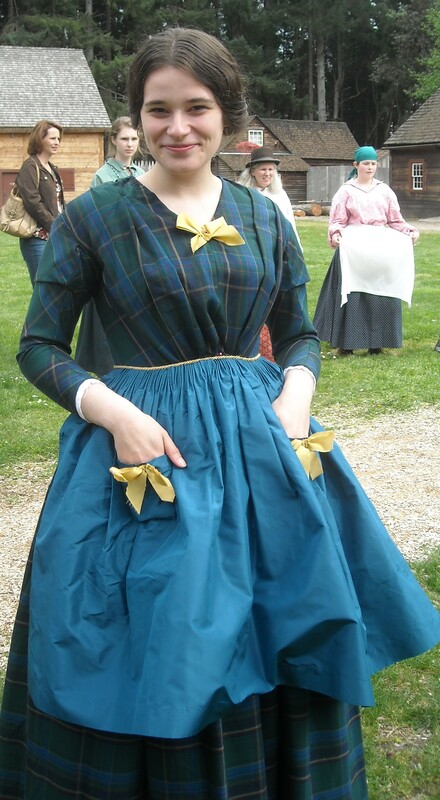 One of the projects I began work on was a dress for my dear reenactor friend, Janelle! I promised her a dress on her 9th birthday, and, well, next month she’ll be turning 10. There were also recently hatched baby chicks at the event. This one I named "Anna Jr." because look how cute she is! Anyways, if you’re going to be in the Pacific NW region, I would highly recommend checking out this exhibit, which runs from now through August! Previous Post Weekend: dress toile, concert, and dyeing fabric for the first time! You looked so beautiful as always. You are really taking your place as Ft. Nisqually premier reenactors. So pleased. What a gorgeous outfit! You look so pretty! Lovely lovely apron, Anna! I adore the bows! Do you have an inspiration pic for your hair? It looks awesome. Wish I could’ve made the event! Thank you so much, Sophia! I was worried about being too “tacky” with the 3 bows, but I think the consensus was that it came out okay.